Holidays, ‘special’ days like Christmas, New Years Eve, Halloween, festivals, parties, sports events and more can be the cause of a lot of waste. For people who try really hard most of the year not to produce waste they can be a bit of a nightmare. Added to that there is often a lot of pressure to spend, spend, spend on these occasions. a) Opt out – don’t join in with these over commercialised events. d) Do a mixture of a) to c) as it suits. I have been doing option d) and I don’t like it. I want to make my mind up and stick to it, but I’ve been learning. I’ve been learning about how to implement the various options and how they impact on me and on the wider world around me. Opting out of something might sound simple, but it isn’t as simple as it first sounds, especially when you are just getting started. How do you convince someone you don’t want gifts this year who has always given you gifts without causing offence? What if you successfully convince everyone that you don’t want gifts and you don’t want cards for any special events and then you suddenly feel that it has all been a big mistake and that actually you really miss that yearly opportunity to tell people you care and for them to tell you they care. How do you replace that hole you made by banishing gift and card giving? What if you decide to stop wrapping gifts in wrapping paper – sounds innocuous enough, but you will get a lot of complaints from people who know you well enough to tell you things straight. Of course there are ways of getting past these things, but all I’m saying is opting out isn’t as straightforward as it sounds. 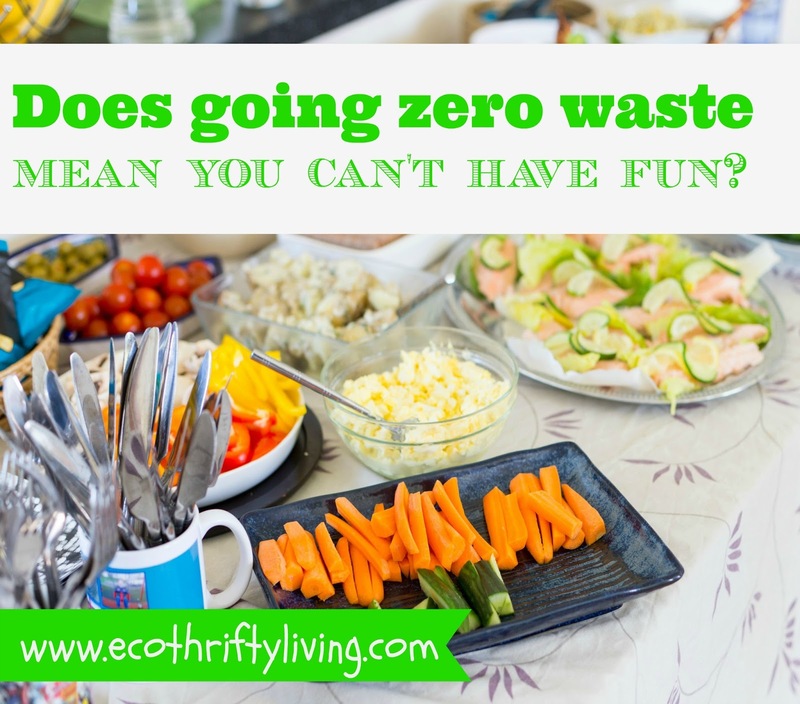 Joining in, in a thrifty zero waste style is a good option, but it can be tricky. What does that mean, where do you draw the line? If you are in charge of organising an event you have far more hope of limiting waste than if you are going to an event organised by someone else. You could tell yourself you are only responsible for avoiding single use items at that event e.g. paper plates, plastic cups, but what if all the food and drink has already been plated and decanted into these vessels – what then? You could put the food on a reusable plate (pointless as the paper plate has already been wasted). You could not eat it because it was put on a reusable plate – that’s going to be a fun party and so on and so on. Telling yourself – you know what s-d it on the thrifty zero waste front for this event can be a bit of a relief. You don’t need to offend anyone, you don’t need to stress yourself out during the event about your every action and so on. But at the back of your mind you know that the amount of wrapping paper used at Christmas could stretch almost all the way to the moon and most of it isn’t recyclable and ends up in landfill or incineration and that the social comfort of providing a wrapped up gift really isn’t a good enough justification to do it. I don’t think any of the options are perfect and there isn’t a one size fits all people and all occasions. I don’t like option d) i.e. doing a mixture of all the above, but until I have found my way with all these things it is my best option for now. How about you – where do you sit on options a) to c) or do you have a better suggestion? This entry was tagged Christmas, eco, Frugal, Green, recycle, reduce, reuse, sustainable, thrifty, zero waste. Bookmark the permalink. ← Intelligent or remote heating controls – what’s the point? I am a big fan of small steps! Even a little change if multiplied over time and people can make a difference! Hope you had a great Christmas!